Rich blue flowers on short stems above hairy lobed leaves. Herbaceous perennial with deep blue flowers. 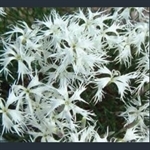 Dark green grassy leaves and large white flowers with deeply fringed petals. Grey-green foliage covered by white or pink flowers. Rose pink flowers and grey-green foliage; the Cheddar pink. Dark red heads of flowers on hanging stems above glaucous grey dissected leaves. Bleeding heart; arching stems with deep red, pendulous, heart-shaped flowers. 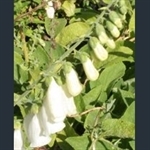 White-flowered form of our foxglove, with tall spires of tubular flowers.